LONDON, Nov 23 (Reuters) - The euro fell nearly half a percent on Friday after signs that economic growth could be slowing across the euro zone. Euro zone business growth slowed much faster than expected this month, a widely-watched Purchasing Managers Index (PMI) survey showed. The disappointing readings were hastened by an ongoing U.S.-led trade war and will likely be of concern to the European Central Bank which is expected to draw a line under its 2.6 billion euro asset purchase programme next month. German private-sector growth slowed to its lowest level in nearly four years as factories in Europe's largest economy churned out goods at a slower pace. The single currency, earlier trading positive, dropped more than 0.4 percent to as low as $1.1402 after the surveys were published. 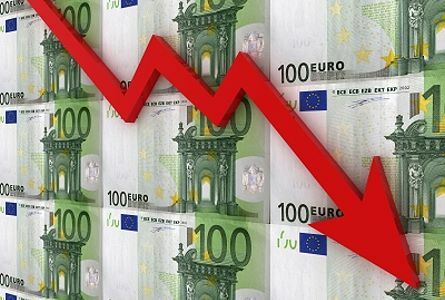 The euro also fell 0.2 percent against the Swiss franc to 1.1326 francs. "Particularly the German PMI was disappointing ... The environment for the euro is getting more difficult," said Thu Lan Nguyen, a Frankfurt-based strategist at Commerzbank, pointing to a dispute over Italyâ€™s spending plans and concerns about the bloc's growth outlook. Weakness in the single currency supported the dollar, which rose 0.3 percent against a basket of currencies to trade flat at 96.706. At 0900 GMT the pound traded down 0.3 percent at $1.2838 after gaining 0.8 percent on Thursday. The Norwegian crown weakened 0.2 percent against the dollar as an overnight drop in oil prices weighed. The yen was at 112.96 yen per dollar, little changed from its previous close. The Japanese currency has traded in an extremely narrow range with a soft bias over the last four trading sessions.